Summertime is here and families flock to the beach. In southern France there is a beach in Piémanson in the heart of Carmargue Nature Reserve that every year from May 1st until September becomes an alternative resort for people from all over Europe. 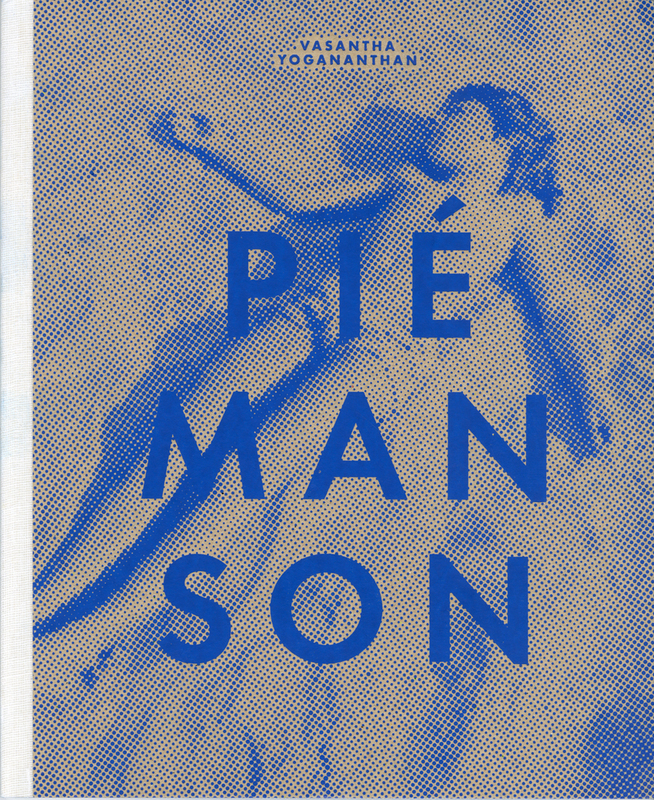 Vasantha Yogananthan has been documenting the beach-niks of Piémanson since 2009. The official line is that the campers can stay for one night without charge but many stay for the entire summer and in that time they construct some amazing structures using wood, plastic sheeting, etc., and whatever they can find to compliment the tents and caravans that they take there. There is a lot of pride in the community for making the best possible ‘homes’ for their stay. There is also a lot of ingenuity and creativity. 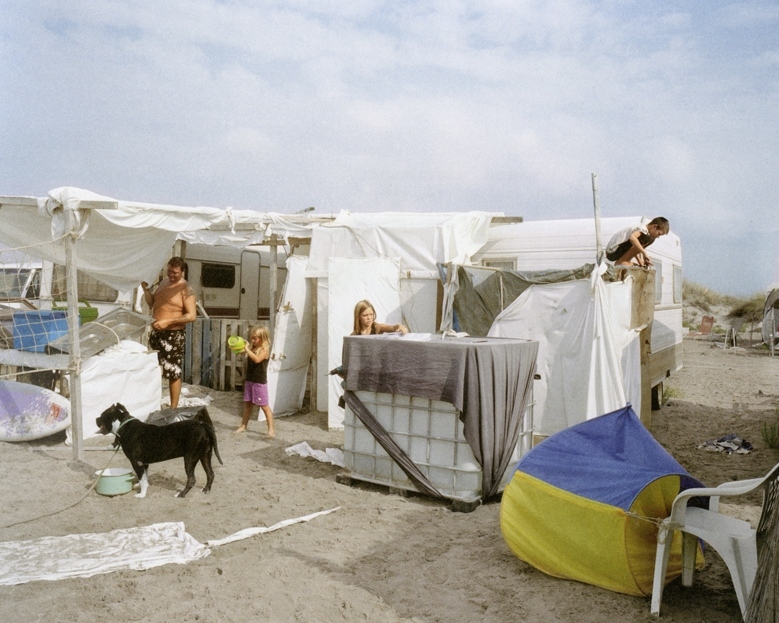 It has to be mentioned that the community at Piémanson who have been coming to live here for free on the beach since the 1970s are not hippies nor are they gypsies – they are regular families who cannot afford vacation’s elsewhere and see a great opportunity to live on a beach for the summer and decide to act upon it. It is the self-published hit of the summer. I caught up with Vasantha and asked him a few questions. . .
Q. What initially attracted you to Piémanson? Why did you decide to go there in 2009? VY: I discovered the beach by chance while I was having a day off in the countryside. The french coastline has been hard-surfaced by realty developer over the last 40 years. Everywhere nature has been converted into suitable touristic resorts. But one could see that Piémanson was the exception to the rule. I began walking looking at all the shelters but I did not stay alone for long: after 10 minutes, a family invited me to share their lunch. Q. When you first went there in 2009 what was that like? Did you ever think at that time that you would spend another four summers going there? VY: I stayed only 5 days in Piémanson in 2009 knowing that I will come back at least 2 more years. The human relationships were far too complex to be understood without living with the Piémanson’s inhabitants (meaning I had to come with a tent – eat and sleep there – for more than a few days). At the time I had no idea it would take me that long. But each year I was coming back I discovered something else. I was drowned more and more in their way of life. Going back was actually very important to feel what Piémanson’s inhabitants feel : a summer’s cycle that has never stopped since the 1970’s. Each year they were leaving Piémanson not knowing if they will be allowed to come back… I think this is what is giving the beach such a mythical status. Something broke open on the third year. 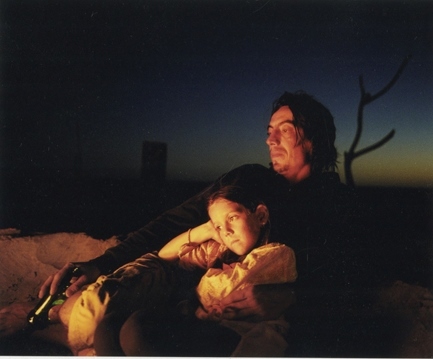 Piémanson’s inhabitants were now considering me part of the “family”. I was able to shoot whenever I wanted, without anyone paying attention. It is quite interesting to note that in the end there is only one picture from 2009 and a few pictures of 2010 included in the book. Most of the interesting pictures came about between the third and the fifth summer I was living there. Q. The collection of images presented to us here have a beautiful light Mediterranean air, but they also seem grounded in the documentary work of a Martin Parr, Paul Graham or Chris Killip. There is an English feel to the work. Do you feel that? Is there an influence from those photographers in your work? VY: Chris Killip is one of my greatest influence of all time. His work “Seacoal” in particular has been critical to my thinking on how to photograph a community with empathy but with the good distance. I have also been greatly influenced by American photography. 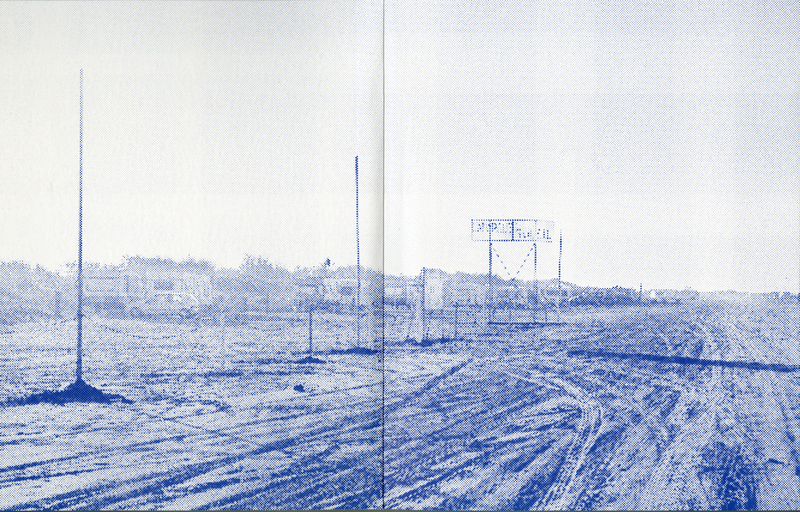 Lately I have to say that one of the greatest work I’ve seen is Bryan Schutmaat’s Grays the Mountains Sends. Q. What do you think is the future for the beach community in Piémanson? Will you go there this summer? VY: I was there 2 weeks ago to offer the book to the families I was living with. It has been a very emotional moment. If the place doesn’t close in the coming years, I plan to come back in 5 years or so to see how the kids I’ve been photographing have grown up. Q. What are you currently working on? Is this project also a book project? VY: I’m currently working on a project in India and Sri-Lanka about the Ramayana. I already did two one-month trip last year. The Ramayana, a masterpiece of world literature written in Sanskrit over two thousand years ago, is to the Asian civilisation what Homer’s Odyssey is to the European civilisation. The Ramayana’s strength is in its apparent simplicity : it can be read as an epic tale in which humans, gods and demons encounter, covering a geographical area from the North of India to the heart of Sri Lanka. However, more than a journey, Indians draw from this text, which conveys moral and philosophical values, an ideal to which they measure their own existence. My project aims to photograph the « Indian soul » and capture the distinctive nature of this continent country, guided by the Odyssey of the Ramayana as a common thread. As this project starts from a book it will be obviously turned into a book. I will mix my photographs with extracts of texts from different versions of the Ramayana, old press clippings and pictures related to the political use of the epic. This way, my photographs will act as an allegory of the epic, the extracts of the myth as the common thread of the story, the press clippings as documents giving historical context regarding the impact of the Ramayana on the Indian society… This is going to be a multi-layered photobook very different than Piémanson. Q. Will you be looking for a publisher or will you self-publish again? VY: I will self-publish it again – I’m already working on the concept of the book (even if it will be probably published in 3 years, I like working slowly on concepts). I have 5 more one-month trips to do and I’m actually thinking the whole project knowing that the medium of predilection to show it will be the book. It think it is very important to know from the very start of your project if you intend to do a book with it. It allows you to pay attention to a lot of details you will not necessarily think about if wanting to do only an exhibition for example (because the viewer will not have as much time as they will while reading the book at home). It helps you working on your narrative while you’re out there shooting. Q. How was the self-publishing experience for you? VY: It was a lot of work, a lot of stress, a lot of doubts, but I’m really glad that I produced the book this way. I’m not sure a traditional publisher would have realised my vision. I made no concessions – either on the editing or on the materials used. For example, we were worried about where in the sequence we should put the one picture I took at night. It has an important meaning in the story so we couldn’t take it out. Finally we decided to produce 650 small prints and to hand-glue them in each copy – just like a real family photo album. It works very well in the end, and I guess the readers are seeing all these kind of details in the book which are part of its originality. Q. Would you recommend self-publishing your photobook to others? VY: I would recommend self-publishing if you are well supported. Self-publishing doesn’t mean you should do everything by yourself. I’ve worked with a graphic designer, a photo-engraver, a professional printer, a translator, a proofreader (etc). You need to put a lot of energy to guide all these people to make the book you want to make. Last but not least, you need to be ready to spend a considerable amount of time promoting the book. You’re not special and if you don’t get out there to show it to people from the industry, no one will buy it. Engaging directly with your audience is also something you need to do. People will be more likely to support you and buy the book if they feel you’re interacting with them. There are many ways to do that, either by giving talks about your work or simply answer to emails from people you don’t know. At the end, I find all this work particularly rewarding. Being in control of everything from the definition of the book’s concept to its promotion allows you as a photographer to show your work exactly how you want it to be seen. This entry was posted in artists' books, International, New Acquisitions, Unpacking the collection, Visual Research and tagged Beach, Carmargue, Carmargue Nature Reserve, France, Matthew Carson, Piémanson, Ramayana, Remi Coignet, Sri Lanka, Vasantha Yoganantha. Bookmark the permalink. Great piece! And excellent advise to folks interested in self-publishing.